This is a cute little studio cabin with a double bed in an enclosed sleeping porch, and two futons. It includes a kitchen, bathroom with a shower, Heater & Air conditioner, and a wood fireplace. You can also borrow some movies from the cabinet outside our main office for fun summer nights in with the family! Outside, there is a large yard for kids to play in and there are a few nice places to sit outside where you can just soak in the sun or watch the deer stroll by. This cabin is in a secluded area with lots of privacy. It is only a short walk away from most of the Wallowa Lake activities and the lake itself. 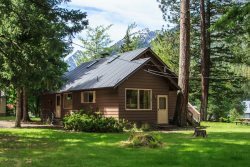 Come to this unique cabin with your family and enjoy all that Wallowa Lake has to offer!